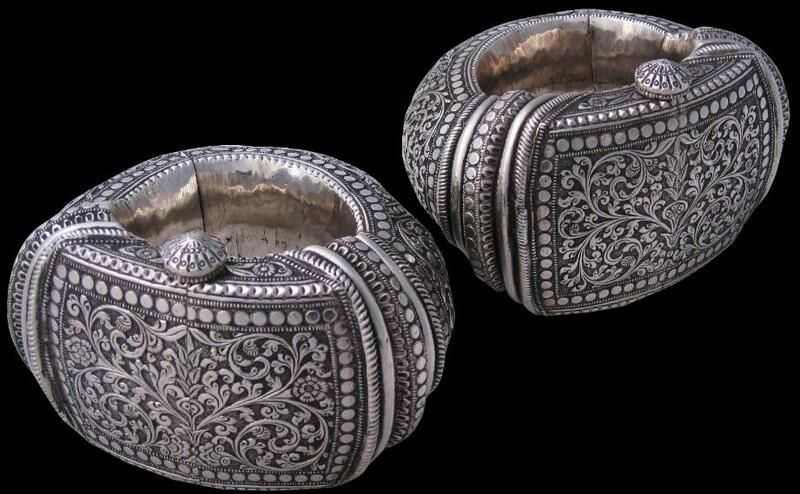 This pair of large, hollow sheet silver anklets open on a hinge when the central bolt is removed. They are beautifully decorated with punch decoration, chasing and applique work and are the finest examples of this style of anklet that we have encountered. 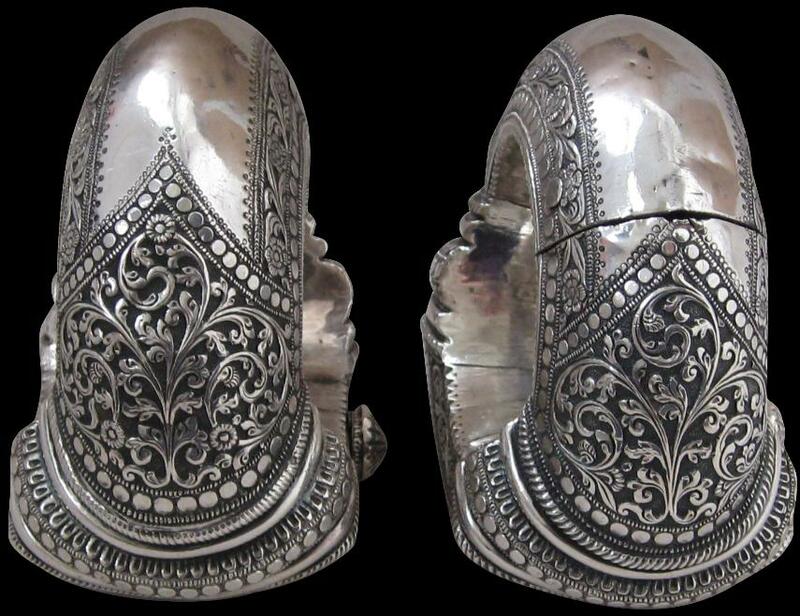 The fronts and sides are decorated with panels copiously worked with entwined floral and foliage patterns very reminiscent of Cutch silver-work The backs of the anklets have plain panels which present a pleasing contrast with the profusion elsewhere. The pair have a wonderful patina consistent with their age. 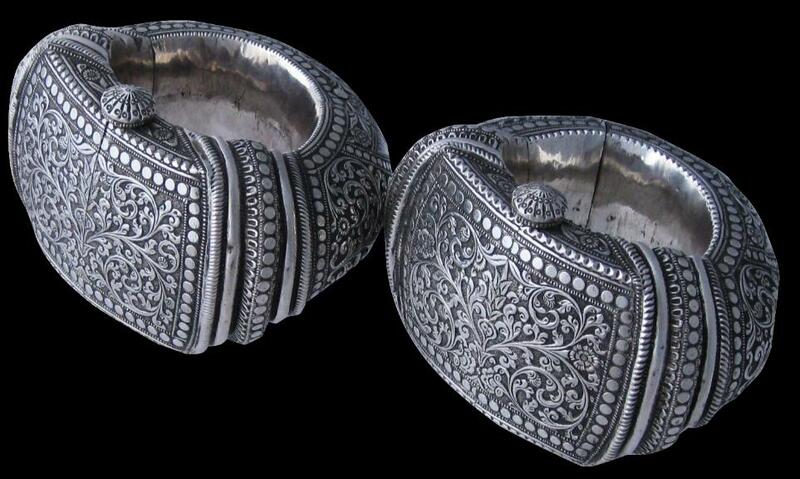 Anklets such as these were worn by women in Gujarat but also were exported to Oman and Zanzibar and from Zanzibar into continental Africa for use by local women and expatriate Indian women. One anklet collected by renown anthropologist Margaret Plass in what is now Tanzania in the 1920s has been (erroneously) attributed to Swahili craftsmen or ‘possibly imported from Oman or further east’. They were used in Zanzibar, possibly in the slave markets. (Ginzberg, 2000). The Zanzibar-Oman connections make sense. Zanzibar was ruled from Oman and there was much trade between Zanzibar and Oman and Oman and Gujarat. Cutch influence is apparent in the handicrafts from and architecture in Oman and Zanzibar of this period. A similar pair from the Collette Ghysells Collection is illustrated in Utracht, O., Traditional Jewelry of India, Thames & Hudson, 1997, p. 272. Also see Ginzberg, M., African Forms, Skira, 2000, p. 220.